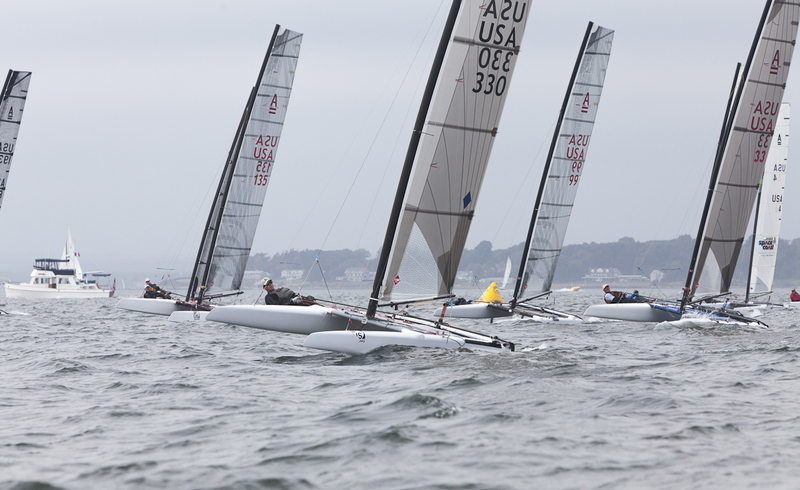 Bristol Yacht Club in Bristol, RI hosted the U.S. Multihull Championship on September 18-21. This regatta is sailed in a different class each year, and for the first time in event history it was sailed in the fast and technical A-Class Catamaran. From the first gun, it was clear that multi-time A-Cat North American Champion Lars Guck of Barrington, RI was the most accomplished and experienced A-Cat sailor in the fleet of 15. Undefeated in 11 races, Guck (sail #330) was awarded US Sailing’s Hobie Alter Trophy. Andrew Gaynor (Barrington) finished second, with Philip Kinder (Portsmouth, RI) third. “Lars and I sail a lot together,” said Gaynor. “We work on our boats a lot together as well. He’s tough to beat, but he’s a good tuning partner. I was hoping to take some races off of him, but he sailed really well. We do a Tuesday night series of A-Cat sailing here at Bristol Yacht Club. There is a lot of talent in this fleet. The only way for us to get better is to collectively work at it. That means bringing the slower guys up, so they can challenge us, and it helps everybody, especially in preparation for Worlds.” The U.S. Multihull Championship is sponsored by Old Pulteney, Hobie Polarized and Gill North America. Visit ussailing.org for more information.